Last week I was in Baltimore for the annual meeting of the U.S. bishops. As many of you know, our primary purpose this time was to address the clerical sexual abuse scandal. Our conversations were candid and honest and expressed the bishops’ deep concern for the victim-survivors of abuse and our commitment to reforming the way we handle allegations against bishops. Dr. Heather Banis, our victims assistance coordinator here in the Archdiocese of Los Angeles, made an impressive and important presentation, and she was one of several lay people to address the meeting. It is a time of renewal in the Church, and I am encouraged by the signs of new collaboration we are seeing between lay people and the bishops. We will continue to make progress on this issue at a special retreat the U.S. bishops are holding in January and at a summit that Pope Francis has called for the leaders of the world’s bishops conference in Rome in February. As I write, there are still thousands of people here in California who are suffering as a result of the wildfires, which continue to burn. Let us keep praying for those who have lost their lives and their homes — and also for all the men and women who are fighting the fires. We have started a fund to help the victims of the fire. If you go to the archdiocese’s website you can find a link to help them. This past weekend, we marked the second annual World Day of the Poor,established by Pope Francis. There are many kinds of poverty, material and spiritual. Poverty is the experience of want, something is lacking, something is needed. We think of the poor as the hungry and homeless, and sadly, we see this type of poverty every day on our streets here in Los Angeles. But there are other ways that people are poor, less visible but no less real. For some in our community, poverty means loneliness; they need someone to talk to, to make them feel they are worth something to someone. For others it is a lack of education; they need someone to teach them or mentor them, to show them the way. Every person who is poor in any way is a child of God who is waiting for the helping hand of a brother or sister. That means you and me. As Christians, we have a duty to bring the poor to Jesus. And we do that by going to the poor, reaching out to them as Jesus did. One of the hopes I have for my ministry is that we can tell all the stories of the good works that are being done in our communities. We hear so many stories of pain and tragedy. This is the stuff of our daily news. But every day in every one of our communities, another story is being told. It is a story of people giving to others, serving those in need; it is the story of people showing love and kindness in small and often hidden ways. These are stories of people making contact, hearts opened to others. And there are so many of these stories. Too many to count, really. But we have been trying. Our Office of Life, Justice and Peace has been compiling the numbers and it is amazing. St. Vincent de Paul served more than 220,000 people at 143 parishes, providing emergency housing, rent assistance, furniture, and more. The Cardinal McIntyre Fund provided more than $300,000 in emergency assistance for families in crisis. The St. Francis Center in Downtown Los Angeles served more than 100,000 people, providing meals and supplies from its food pantry. Good Shepherd Center for Homeless Women and Children provided emergency shelter and transitional residences for more than 1,200 mothers and their children. 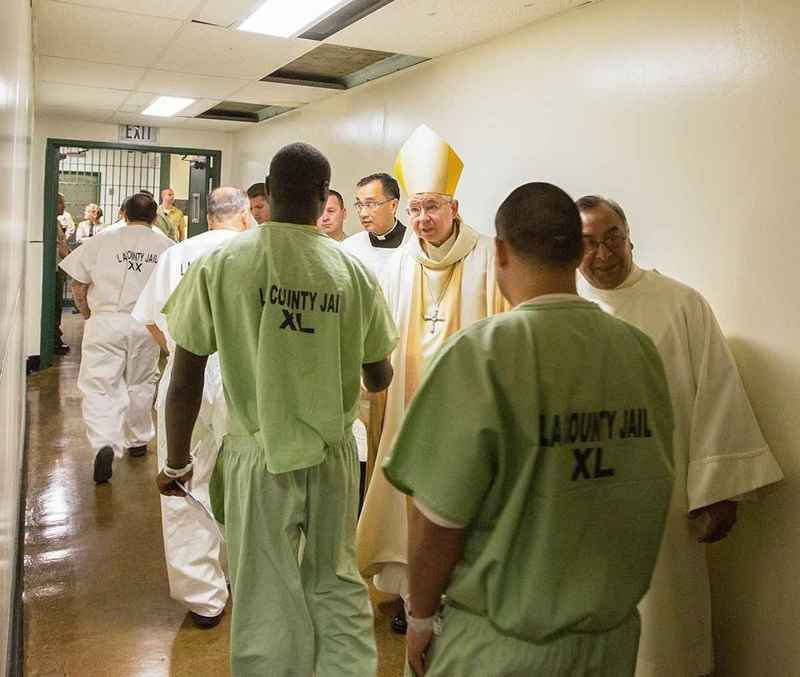 LA Catholics make an impact. That is the truth! And it is the name of a new initiative we have begun here to encourage more of us to get involved in volunteering our time to serve those in need. The Life, Justice and Peace Office has put together a long list of volunteer opportunities — from helping children with special needs to serving the sick and the elderly, working with the homeless, feeding the hungry, and helping pregnant women and infants. I urge you to check out our new website — lacatholics.org — and get involved. It is our beautiful duty to serve the poor. And as the saints remind us, in serving the poor we have a privileged encounter with Jesus Christ. Pray for me this week and I will be praying for you. As we celebrate Thanksgiving this week and prepare for Advent, let us ask our Blessed Mother Mary to help us to open our hearts to one another in a new way, especially to our most vulnerable brothers and sisters.